If you’re looking for a vibrant yet refreshing way to spend your Saturday mornings – rain or shine – look no further than the Withrow Park Farmers’ Market. 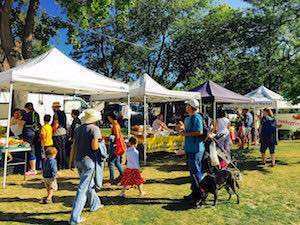 The market is celebrating 12 years of uniting the community through wonderful live music, arts and crafts activities for kids, and of course, great local food. You can be sure to find certified organic, non-GMO, and sustainably produced products and goods sold at the market. Pick up fresh fruits and veggies, sip a coffee, and enjoy the laid-back atmosphere and opportunity to connect directly with farmers and food entrepreneurs.